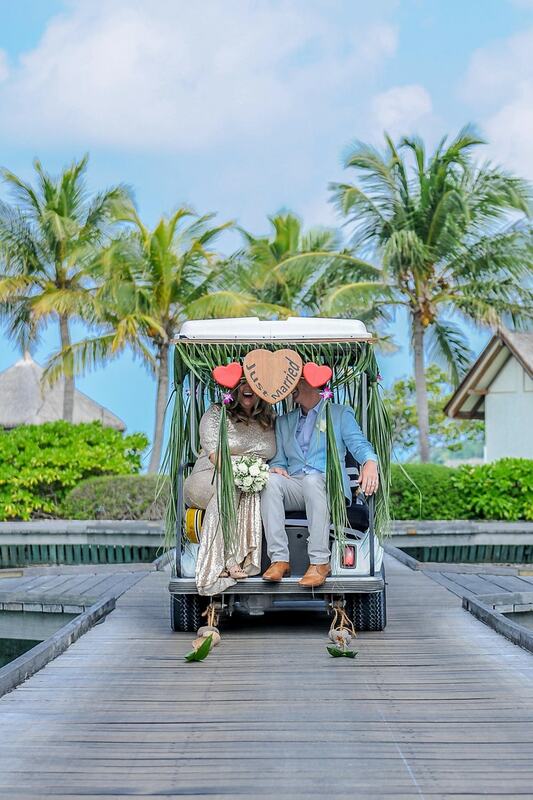 If there is a heaven on Earth, then it must be the site of Cara and Jamie picked for their destination vow renewal! 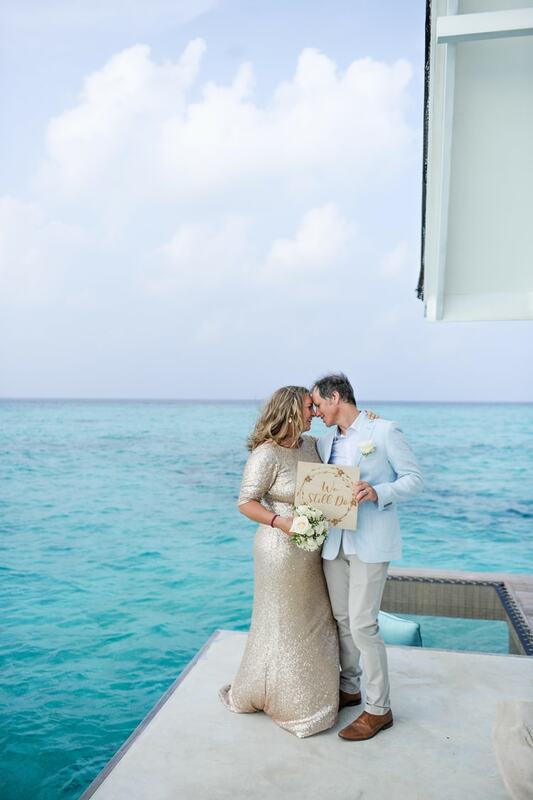 The first photo in this Maldives wedding album made my breath catch in my throat! 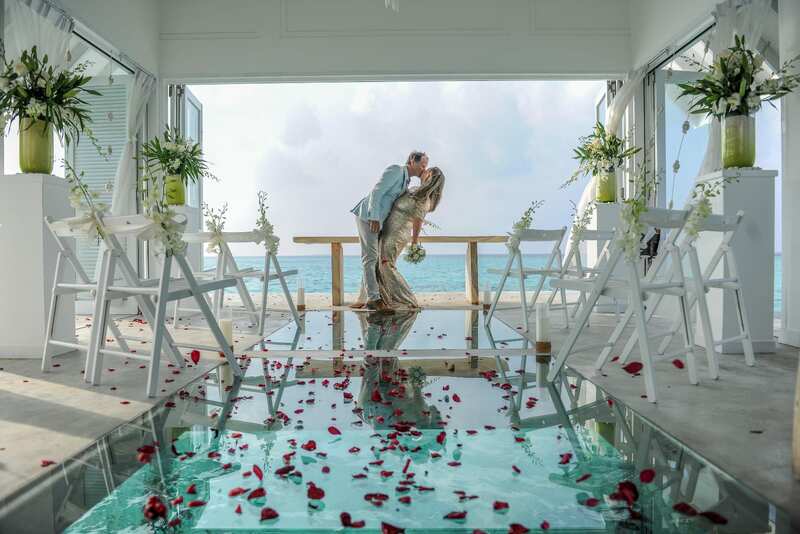 Turquoise waters, crystal clear blue skies – and a private venue built on stilts right in the middle of it?! Who knew places like this existed? 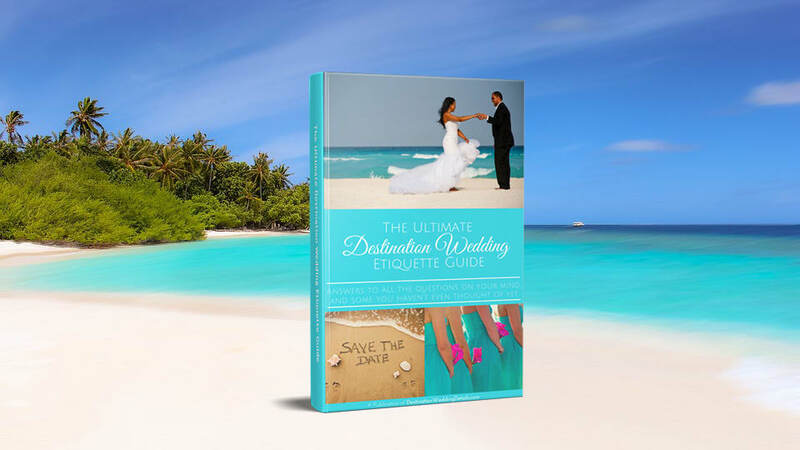 And that’s why I LOVE my job writing about destination weddings and all the incredible places people explore! 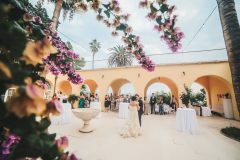 Cara and Jamie are both wedding celebrants themselves, and they wanted to celebrate their 10-year anniversary in style. You see, they got engaged on an adventure through Rome and got married on a secluded island off Brisbane, Australia. So they had to come up with a way to top those two! 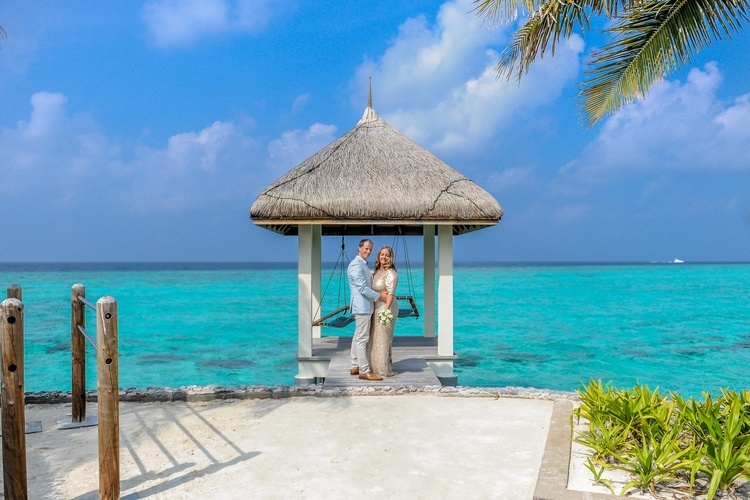 And I think they nailed it by choosing the island chain nation of the Maldives in the Indian Ocean. 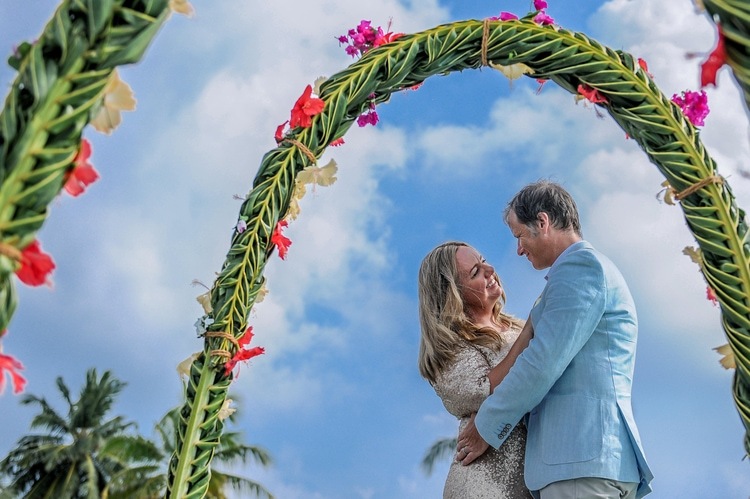 But how does a couple plan a remote island wedding from halfway around the world? 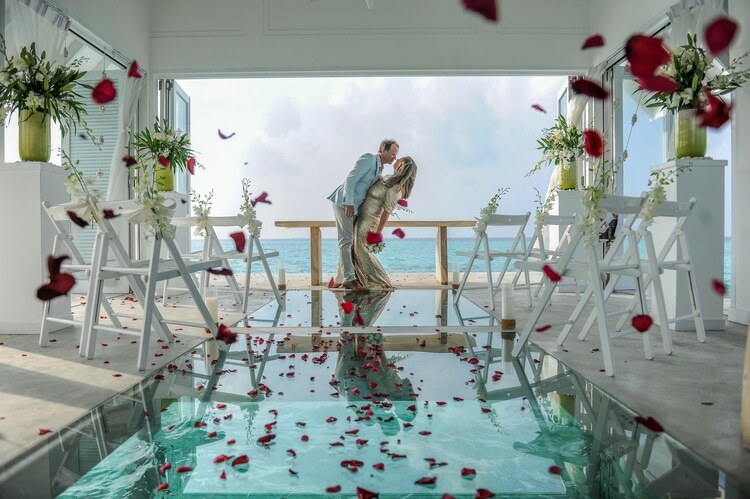 These two cleverly found Mohamed Shafy from Digital Studio Photography, followed him on Instagram to get a feel for his work, and ultimately allowed him to guide their choices. 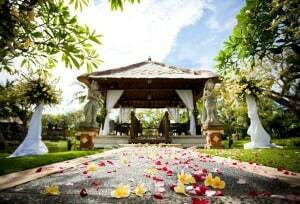 So now, can we talk a little bit more about this venue? 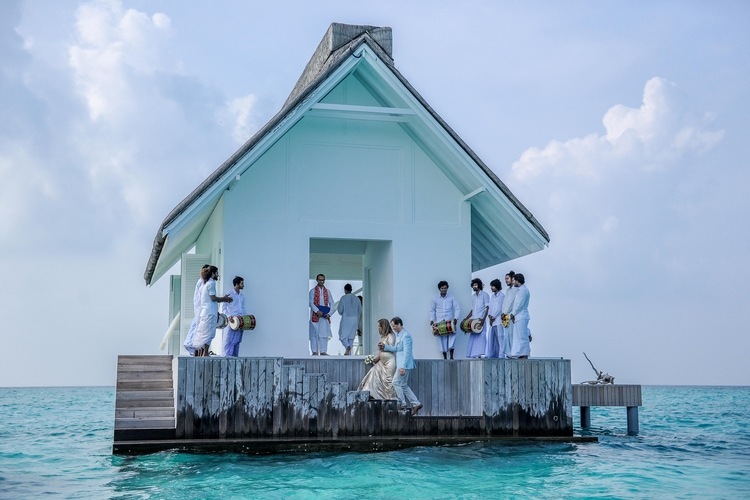 The ceremony took place at the overwater wedding pavilion of the Four Seasons Landaa Giraavaru. Take a look at the glass floor — you can see straight through to the ocean! 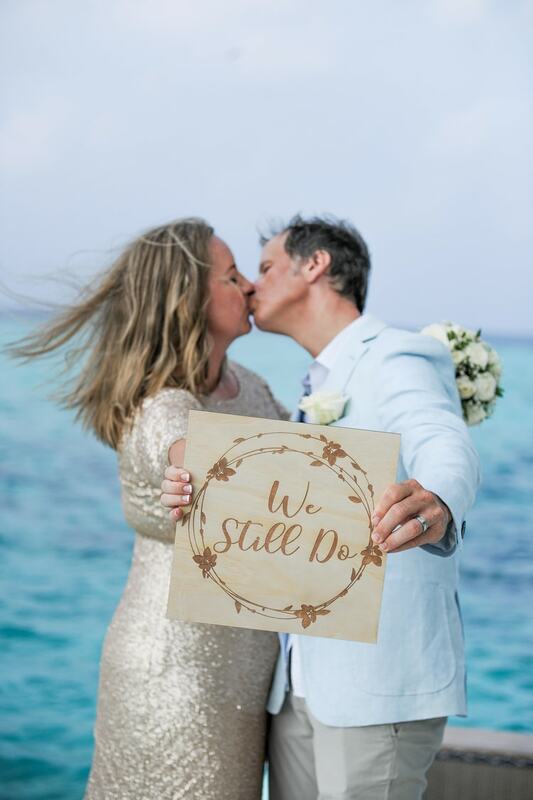 With champagne, rose petals, Cara’s gorgeous champagne sequined gown, and a wooden sign carved simply to say “We Still Do” –I’d say this couple is winning at their marriage! 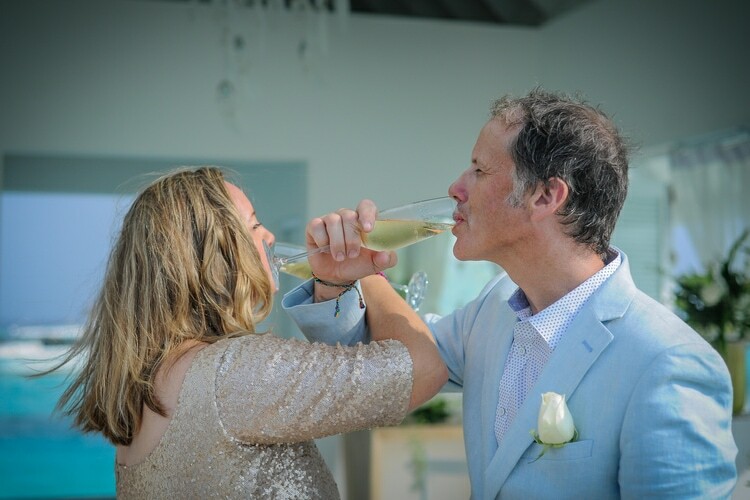 We met 15 years ago in Auckland, when a mutual friend ‘Abi’ spontaneously decided to set us up, we connected immediately and have been inseparable from day one. 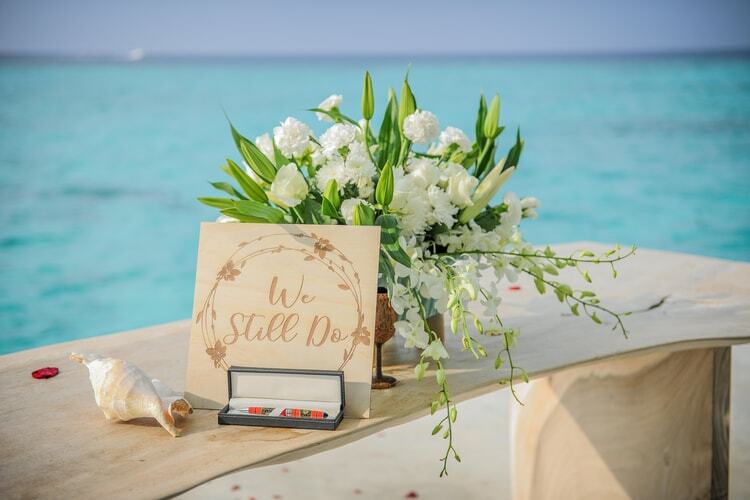 We will always be grateful for her matchmaking skills so we had a wooden sign made which we brought with us to show our gratitude. During a trip to Europe Jamie booked a weekend getaway to Rome. We spent the day exploring the sights, before returning to our hotel room. We stood by the shutter windows when Jamie dropped to one knee and popped the question, it was completely unexpected and a beautiful moment. 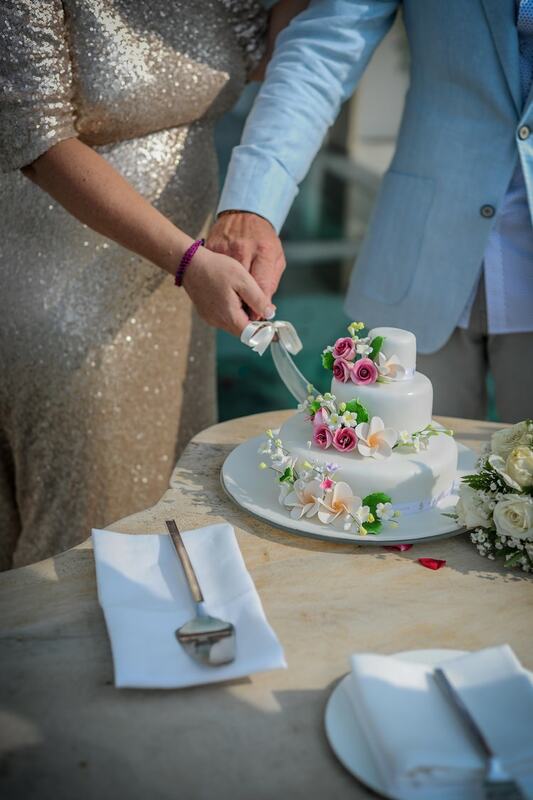 We married 5 years from the date we met, on a secluded beach in Australia, on an island off the coast of Brisbane. We had 32 guests, most of whom traveled all the way from the UK and New Zealand. 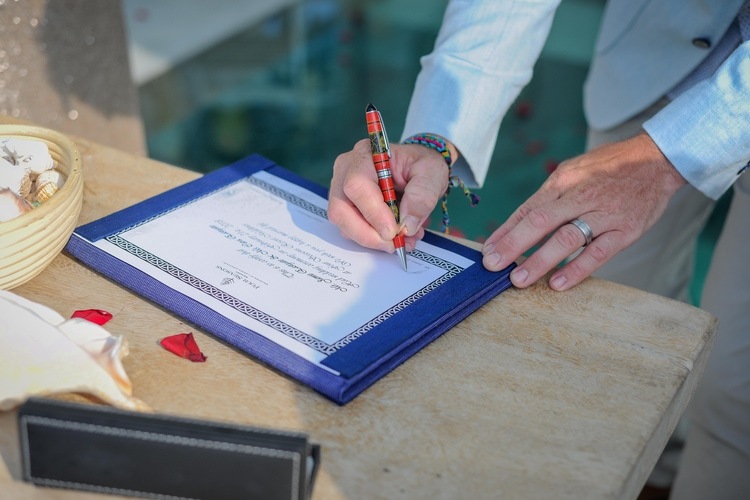 Tell us about your Maldives Wedding Vow Renewal. 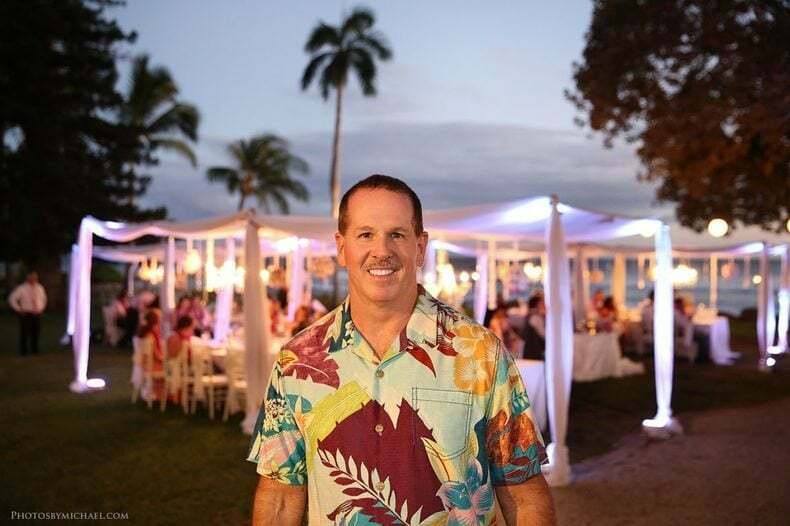 What was your vision? 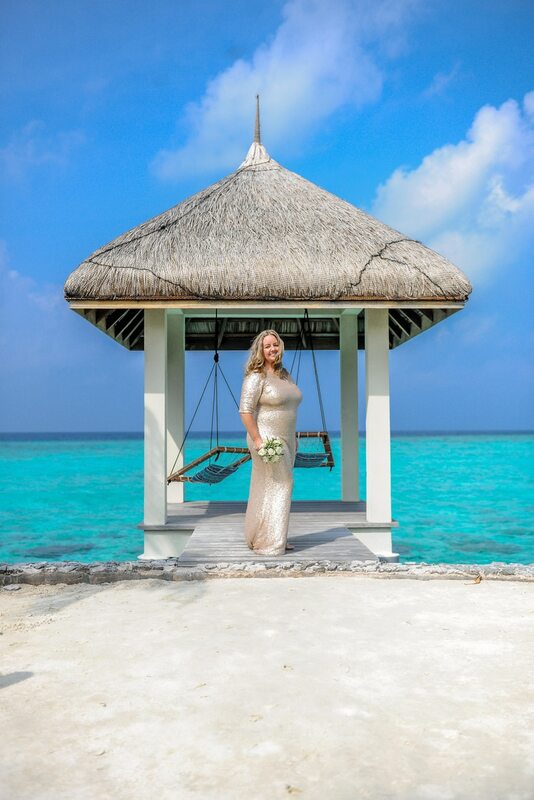 A relaxed and thoroughly enjoyable day to celebrate 10 years of marriage surrounded by the crystal-clear sea. 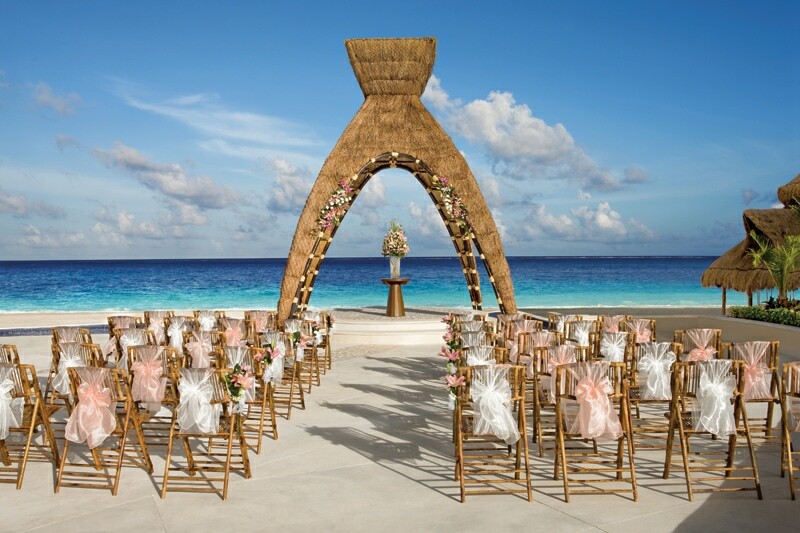 Where was your vow renewal ceremony held? 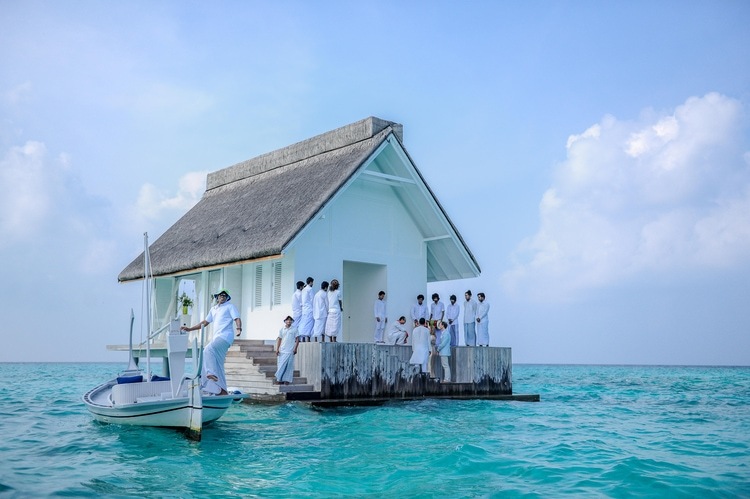 Our ceremony took place at the overwater wedding pavilion at Four Season Landaa Giraavaru. 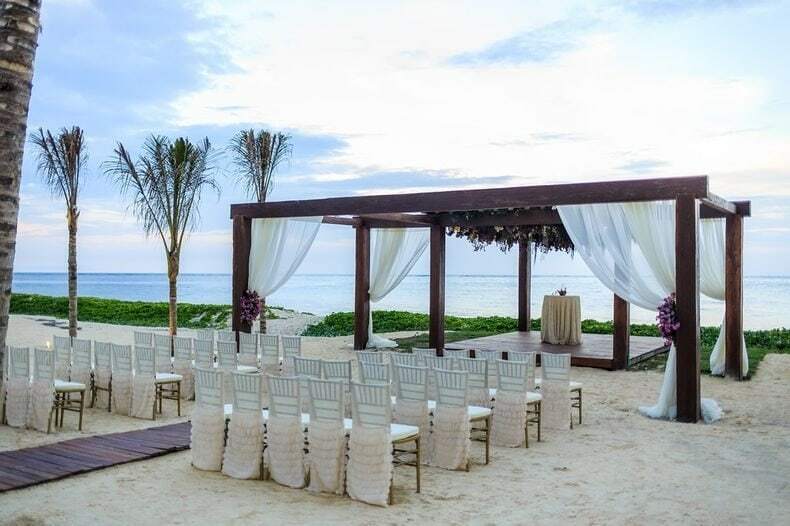 It truly was a dream destination wedding location! 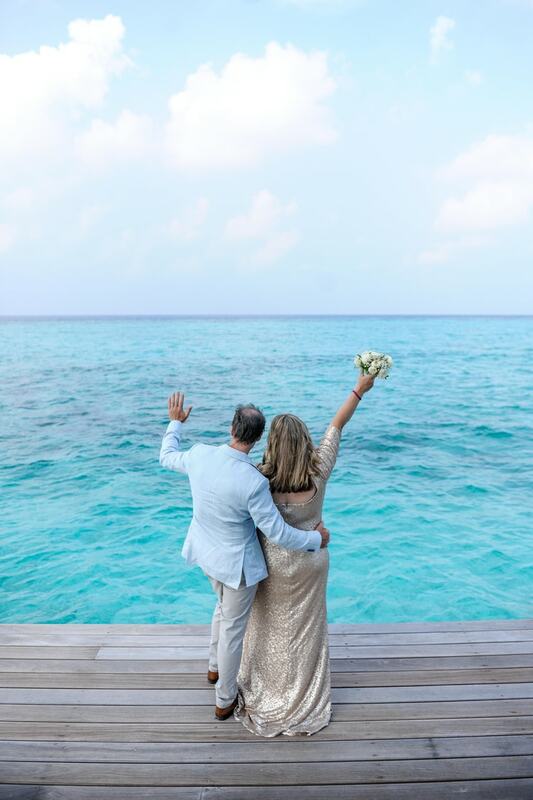 We sailed to the overwater pavilion in a traditional Maldivian Dhoni boat, it was such a picturesque way to arrive and we were giggly with excitement by the time we arrived at the stunning overwater pavilion. On arrival, the island band played the drums and sung a traditional song. 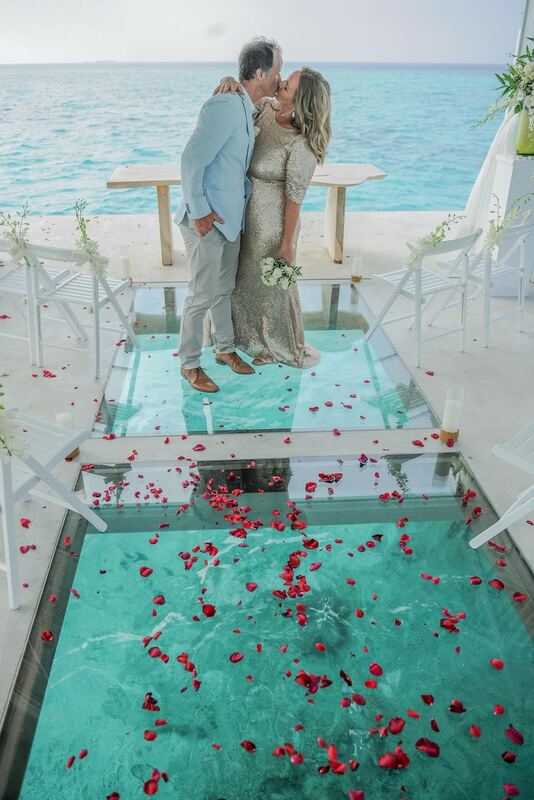 We felt so special as we made our way up the clear glass aisle together which beautifully showcased the sparkling ocean beneath. Then we turned to each other and joined hands. 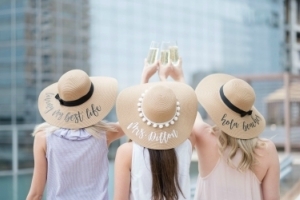 Admittedly, our Celebrant hats went on for a moment as we both ensured we were perfectly centered! 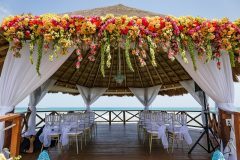 Our fantastic Wedding Coordinator Raneesh, did such an amazing job with the pavilion’s styling! 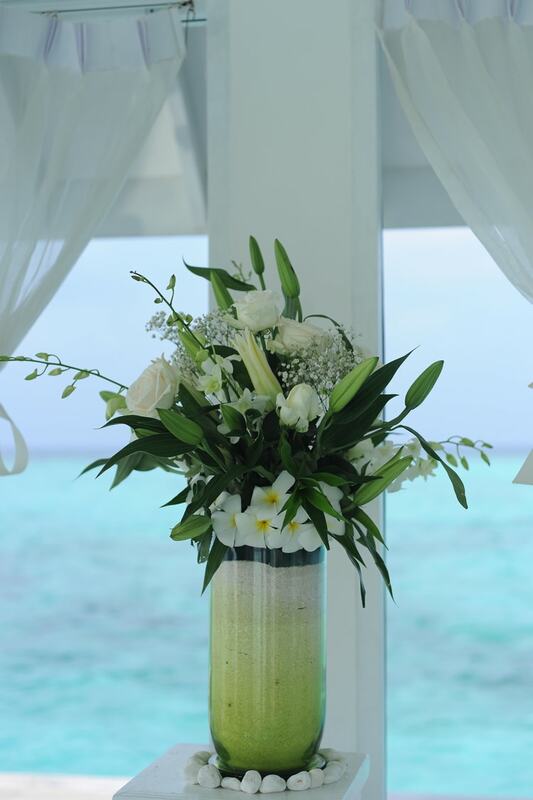 They had white vendella roses and orchid arrangements throughout the pavilion shipped in from Sri Lanka especially for us. 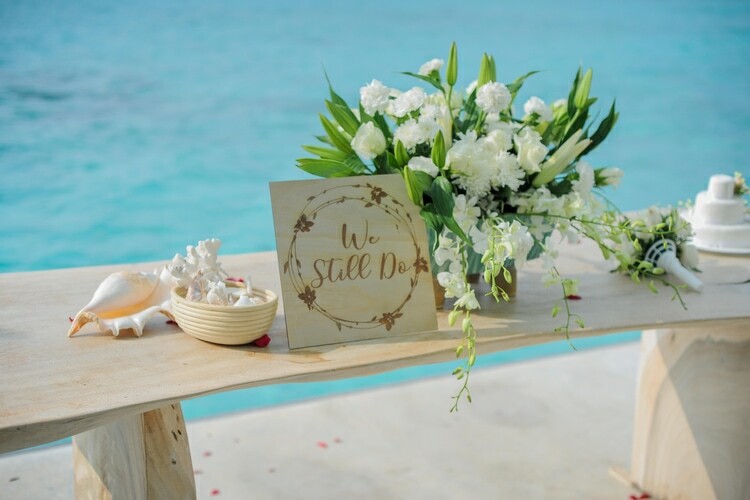 We brought our own custom-made sign for our wedding backdrop with the words ‘We Still Do’. 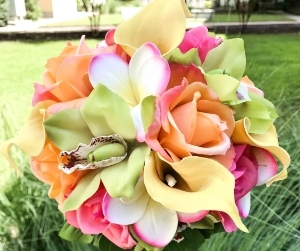 It was placed with the floral arrangement and tied in with our ceremony wording. 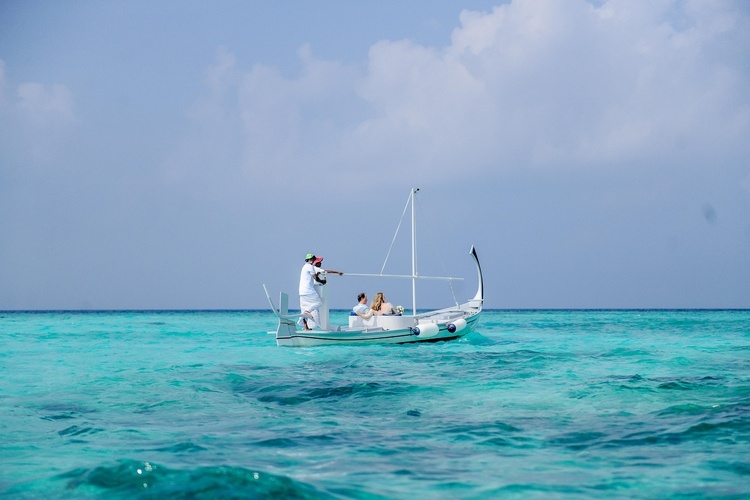 Can you share special moments from your Maldives Vow Renewal? 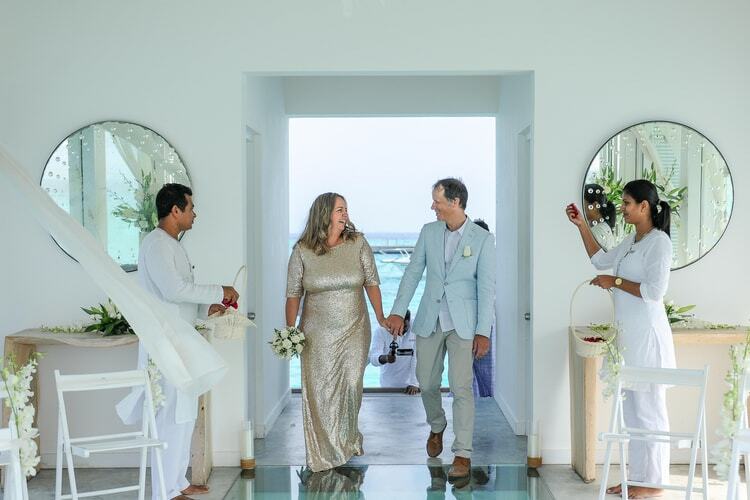 Our ceremony wasn’t so much about renewing our original vows, it was more about celebrating our relationship and our marriage, recognizing the challenges we’ve faced together over the past decade and celebrating the triumphs. 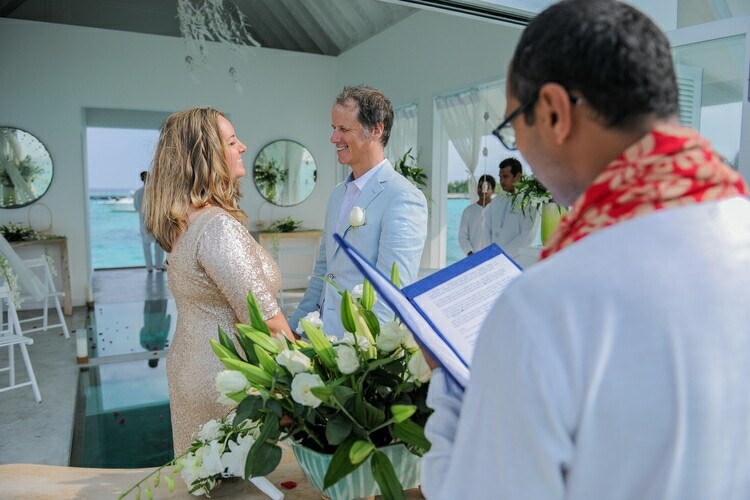 Being a Celebrant, I couldn’t resist writing our own ceremony which reflected on our journey together and how we’ve continued to grow both individually and as a couple. 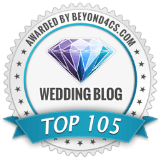 I managed to keep this a surprise from Jamie who heard it for the first time on the day, which made our ceremony even more special. 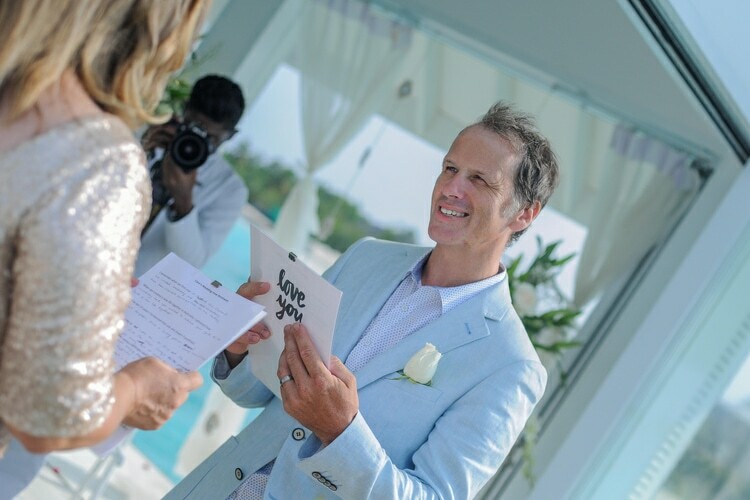 For our vows, we agreed on 8 ‘sentence starters’ which we completed separately and shared for the first time during the ceremony. Needless to say our words to each other were very much in tune. 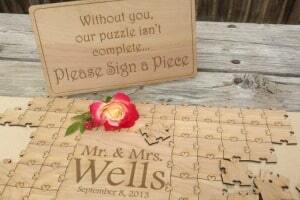 We spoke each vow in turn and aww’d and giggled at the similar things we’d each written. The ceremony was both meaningful and at some points pretty damn hilarious. We looked into each other’s eyes with love, we laughed, we fist pumped and we didn’t stop smiling. It was such a special moment. 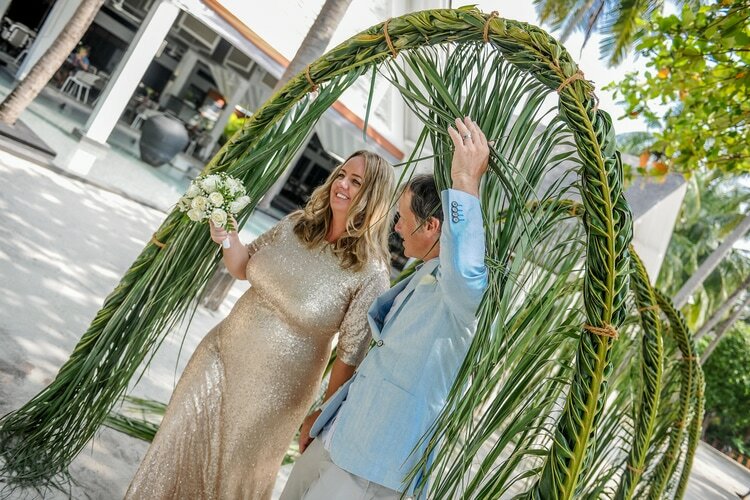 As we had no guests attending, we kept our ceremony short and sweet which was perfect. 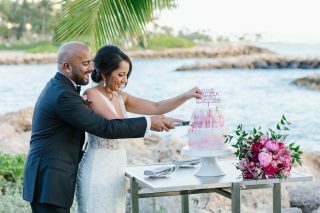 Where did you celebrate your vow renewal reception? 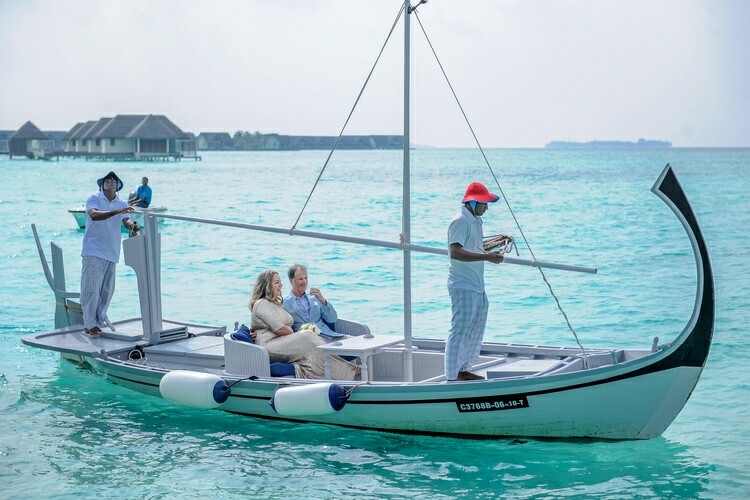 Four Season Landaa Giraavaru went above and beyond arranging for a boat to take us to a floating wooden deck in the sparkling lagoon. 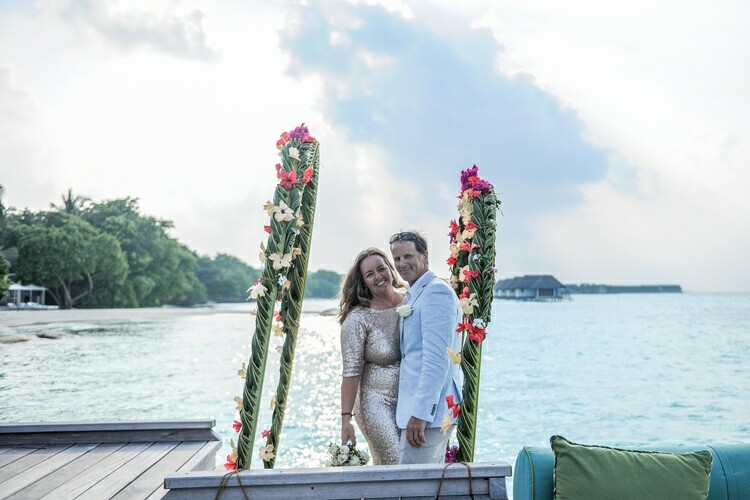 It felt so romantic and private and it was just amazing to watch the sun slowly set in it’s breathtaking dramatic Maldivian style, lighting up the sky. 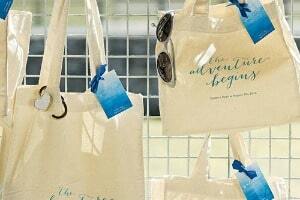 We knew this was a once in a lifetime experience and we savored the moment. 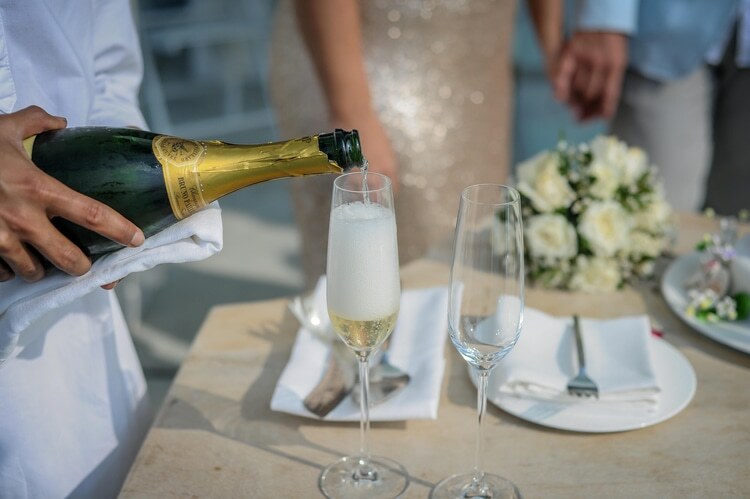 Our mid-ocean dining experience included a delicious 4 course meal accompanied by chilled champagne, with the waiter returning by boat to serve each course. 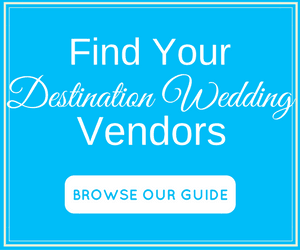 Tell us about your vow renewal gown. I had a last minute change of mind with my dress. 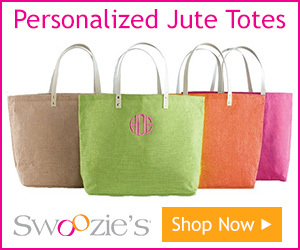 After seeing Jamie’s outfit, I decided I needed something a little more special than what I had originally planned. 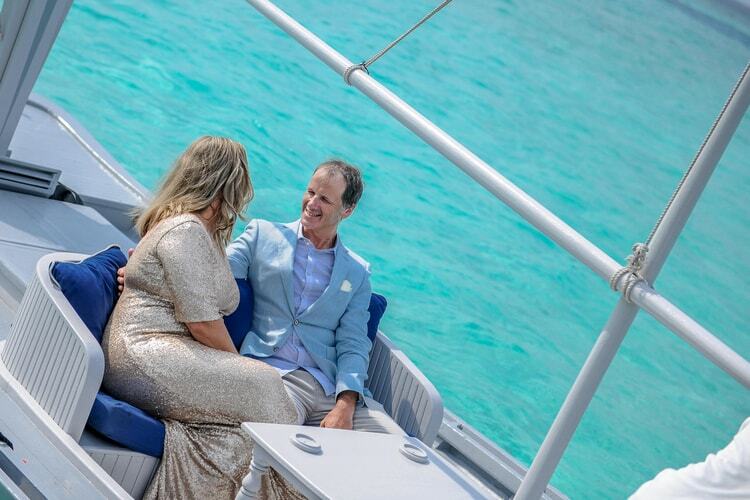 As this wasn’t my actual wedding, I decided against wearing white, and instead opted for a long sparkling champagne sequin gown, with a small train. Vanessa from ‘When Freddie Met Lilly’ was fantastic, combining 2 of her dresses to custom make my gown all in a very tight timeframe. I am so grateful to her and love my dress which was so comfortable to wear. 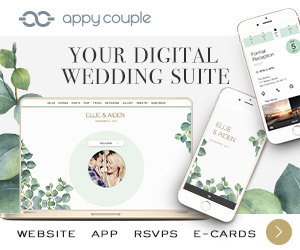 Did you have a second honeymoon? [We transferred] to a nearby island by speedboat the next day. 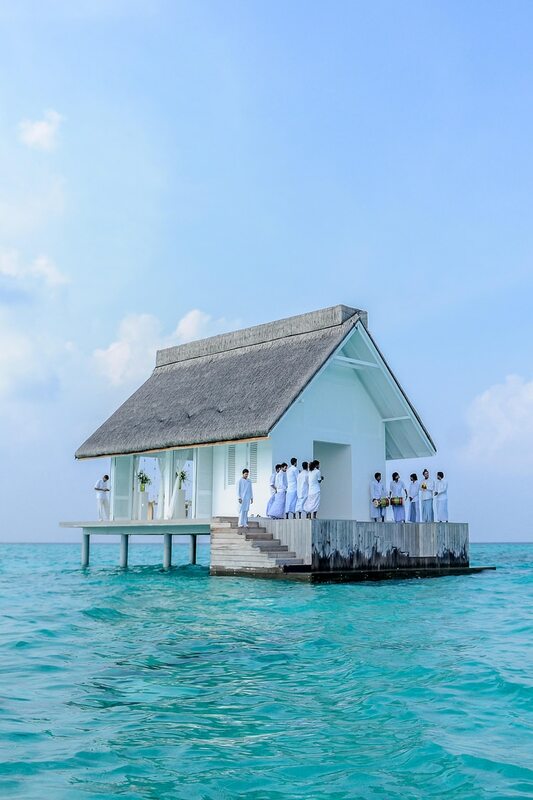 Our resort Finolhu was all-inclusive with overwater pool villas. 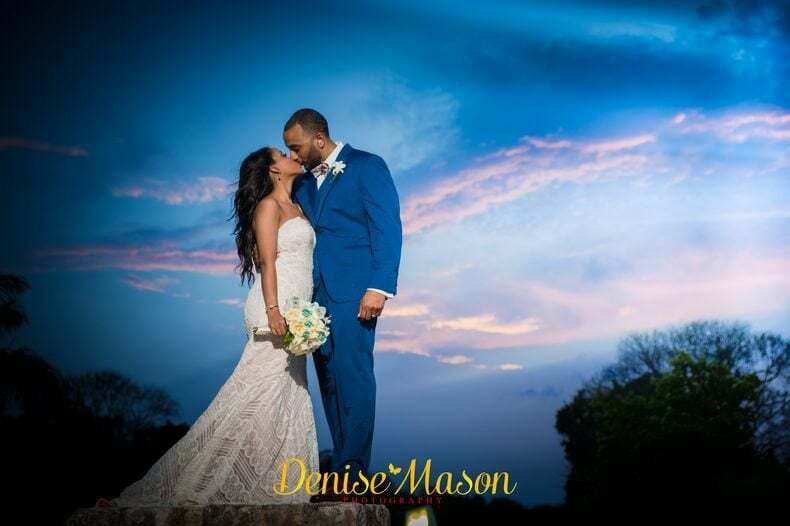 It was so relaxing and we absolutely loved reflecting on our special day while we enjoyed fantastic food, drinks and the most amazing sunrises and sunsets. 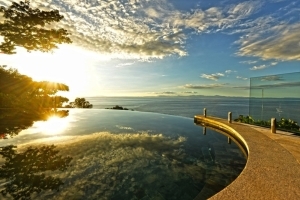 From the comfort of our villa, we saw the most beautiful brightly coloured fish, manta rays and we even spotted dolphins one day. We couldn’t have asked for more. 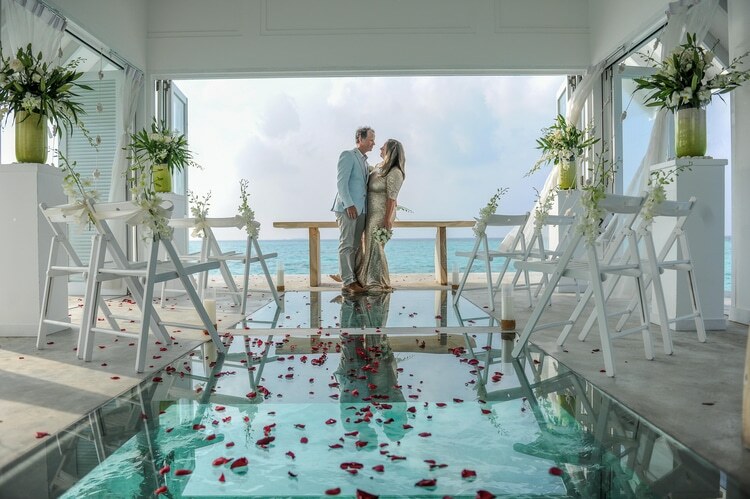 As our vow renewals took place in the Maldives, we went with the venue’s recommended Photographer: Mohamed Shafy from Digital Studio for photography and real drone shots. 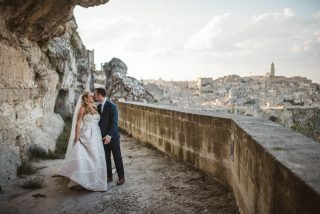 We followed each other on Instagram (shafymv) a year before our wedding so we got to know their style, and they got to know us a little too. 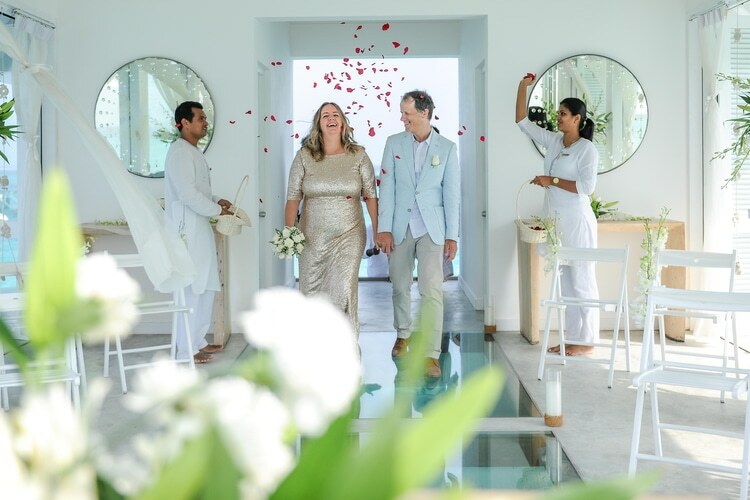 When we met for the first time on the day of the wedding, they felt so familiar and we were instantly relaxed around them. 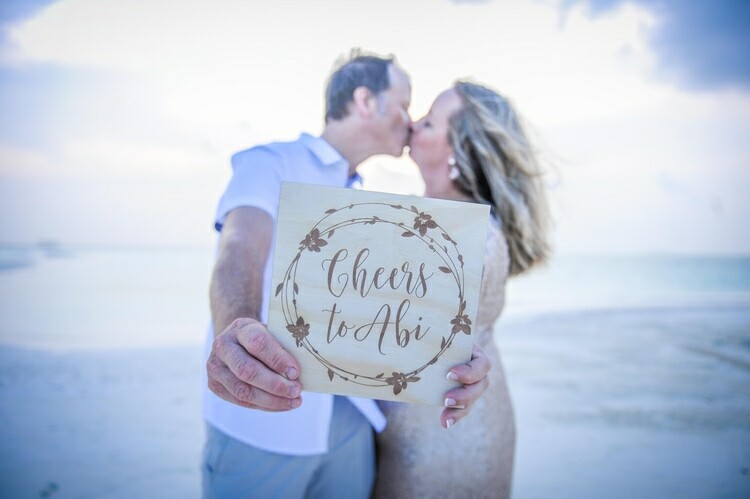 We would love to continue the tradition and renew our vows every 10 years, so I guess we have 10 years to decide on the location and start planning our next vow renewals! 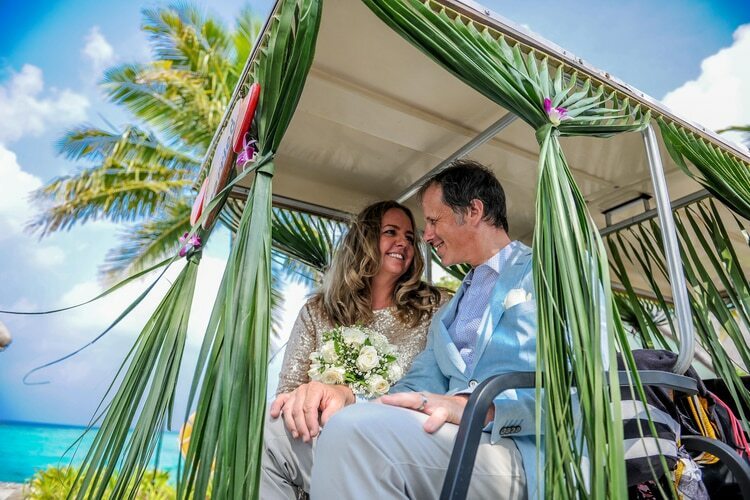 We feel our own first-hand experience of renewing our vows has really equipped us for writing genuine and authentic vow renewal ceremonies. 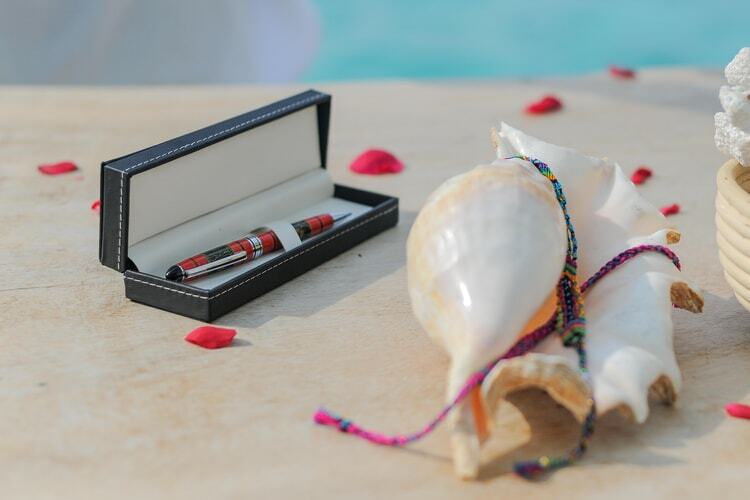 It also allowed us to explore new ways of writing ‘vow renewal vows’ which we are so excited to share with our vow renewing clients! 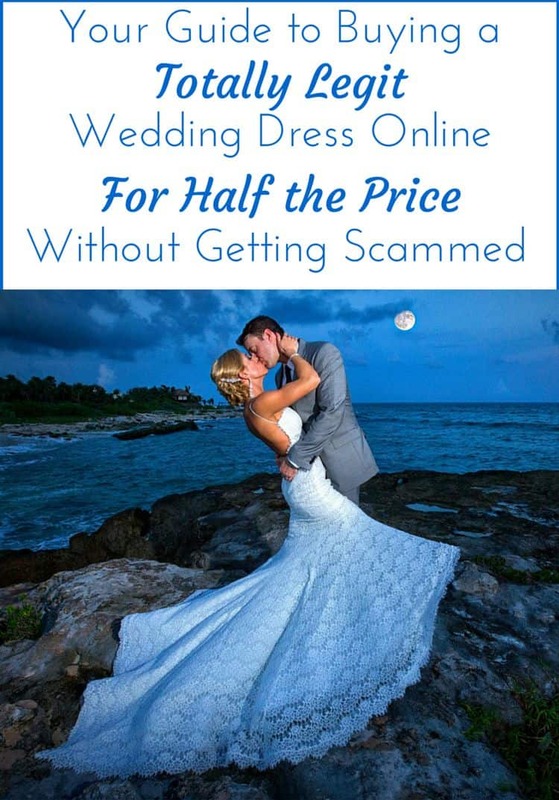 This is an amazing idea for an anniversary! Loving all the photos! Wow! 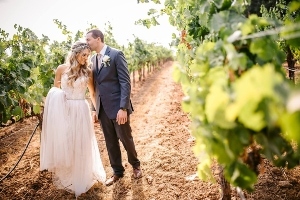 Beautiful photos of the stunning couple!